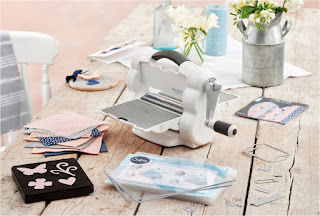 Don’t miss the latest machine to join the Sizzix family! Introducing the Big Shot Foldaway - a compact shape cutting and embossing machine that neatly folds away meaning it’s perfect for creating on the go and freeing up space. This brand new machine also comes with exclusive bonus content – a 5.5” x 6” paper pad, 4 pieces of felt and 4 pieces of fabric all designed by My Life Handmade, plus 10 Thinlits™ Dies and a Bigz™ die, so you can start creating straight away. The Big Shot Foldaway is available from 18th September, but you can pre-order from Cotton Patch now by clicking here. It is priced £124.95 (RRP £149.95) and is post free in mainland UK. You can find out more information about the Foldaway our range of Bigz dies in the latest edition of our Sizzix e-book. You can compare the different machines and find out more about the latest dies, with many containing video guides. But first, check out this video to see exactly what the Big Shot Foldaway is all about!